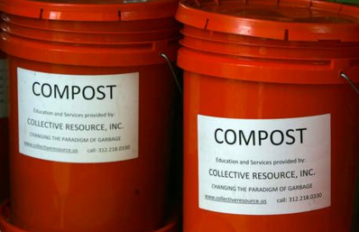 Collective Resource is proud to be an official composting partner of the City of Evanston. Through a program approved by the City, all of Evanston can now take advantage of special low rates. 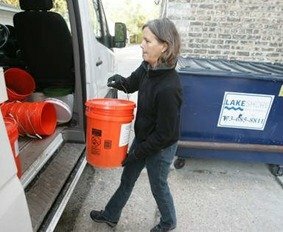 Now Evanston residents can keep composting all winter long. Our Winter Gap Program covers the months that Evanston's Yard Cart service is suspended. Weekly Basic Bucket Service is just $27 a month pre-paid! To set up service please fill out our sign up form. Remember to check the box for weekly or biweekly service and choose "City of Evanston" in the drop-down menu for "How did you hear about us?" Weekly Basic Bucket service is $27 and biweekly service (every other week) is $20.50 per month. Save with annual and quarterly payments. Click here for Deluxe Service options and further details on Basic Bucket service. Multi-unit buildings, restaurants and commercial businesses can benefit from our 32-gallon tote service.